описание (ru) SurvPC - Мощный программный продукт для сбора полевых данных во время проведения геодезических изысканий от компании Carlson Software. Carlson SurvCE является оптимальным выбором программного обеспечения для сбора данных, сочетающим передовые функциональные возможности и простоту в использовании. Пользователь SurvCE получает программное обеспечение, которое имеет бесплатную удобную техническую поддержку и постоянно совершенствуется в соответствии с пожеланиями клиентов. SurvCE представляет собой полную систему сбора полевых данных для GPS и ГЛОНАСС приемников в реальном времени (RTK) и обычных / роботизированных тахеометров. 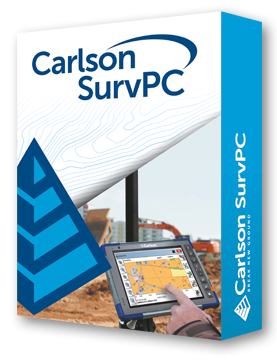 description (en) Carlson SurvPC - get the world's most flexible & powerful data collection software on the PC platform. This means: increased hardware capability; increased virtual memory & increased ability to work with large sets of data; increased screen size & more convenient touch screen usage. Like Carlson SurvCE, SurvPC supports the widest range of popular and new release RTK GPS and conventional/robotic total stations. Carlson SurvCE and SurvPC are complete data collections systems for Real Time Kinematic (RTK) GPS and Total Stations with in-field coordinate geometry. SurvPC can be utilized on standard Windows PC computers such as ruggedized laptops. Advantages include: Bigger screen display; Bigger buttons (on touchscreen computer); More graphic power; More processing power; Full Windows PC compatibility; File formats same as Carlson office products (.fld vs .fcl files for field-to-finish); Compatible symbol libraries; Import Microstation .dgn files; Import and Export AutoCAD .dwg files; Aerial photo overlays; Output to Excel. New from Carlson SurvPC crack is the ability to work in the Esri ArcGIS system, yet with a familiar interface, achieving seamless accuracy in GIS. New functionality allows users to use Esri’s Map Objects to perform all survey functions with no downtime learning new software. In the new ArcGIS-enabled version of Carlson SurvPC 6 crack, Esri’s Desktop can be used intuitively to perform all survey functions; ArcGIS points, lines and polygons can be used for staking. ArcGIS Nodes can be used for resections and localization; and users will be able to query GIS feature attributes at any time with the Store Points, Stake Points, and Map View screens.